√ Resolve references to resources and classes. 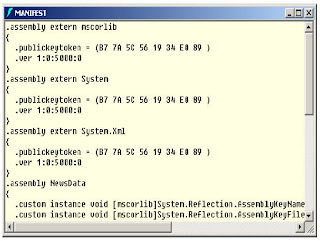 √ The assembly manifest can be stored in either a PE file (an .exe or .dll) with Microsoft intermediate language (MSIL) code or in a stand-alone PE file that contains only assembly manifest information. Where is version information stored of an assembly ? (I)Is versioning applicable to private assemblies? Twist :- What are situations when you register .NET assembly in GAC ? √ If the application has to be shared among several application. √ If the assembly has some special security requirements like only administrators can remove the assembly. If the assembly is private then a simple delete of assembly the assembly file will remove the assembly. Note :- Registering .NET assembly in GAC can lead to the old problem of DLL hell, where COM version was stored in central registry. So GAC should be used when absolutely necessary. What is the concept of strong names ? Twist :- How do we generate strong names ? Twist :- What is use the of SN.EXE ? Twist :- How do we apply strong names to assembly? Twist :- How do you sign an assembly?